The Shadow is one of my favorite pulp characters, but more for the appearance and mythos than for reading pleasure, which is a backhanded compliment, I know. The simple translation is that I am enamored of the character, but I simply haven’t read as many of his books as I have Doc Savage or the Avenger. I read The Living Shadow when I was a kid, shortly after discovering Doc Savage and before the Avenger started getting released, and discovered I didn’t blaze through the story as quickly as I did a Doc novel. I would say that this first Shadow novel has one of the best beginnings of any pulp novel I’ve ever read. Harry Vincent on the bridge about to commit suicide, the Shadow appearing out of the night to save him and then command ownership of his life. That stuff is just pure pulp, and I loved it. The problem is that the book immediately settles down into a pure mystery novel and the Shadow takes a minor role in his own adventure. Luckily, those old paperback covers (and a love of Mike Kaluta’s art and the fantastic stories in the DC Comics run in the ‘70s) kept me reading them and I started finding books where the Shadow was up front and blazing justice with both .45s. Don’t know how or when he worked his reloads, or how he got around so silently carrying all those bullets, but that didn’t matter at the time. Still doesn’t matter to me, but I re-read the first book, getting in touch with my pulp roots to stay fresh in my writing, and was disappointed to discover the adult me wasn’t any more enamored of The Living Shadow than I was the first time. I’m going to try to read the first three or four in order, but I may have to skip ahead to one of the Chinatown books before long. This first book lays out the world of the Shadow, though, and introduces a lot of the Shadow’s agents, though not nearly all of them. I wasn’t really happy with the mystery because it felt like it could have been a short story on its own and served only to bring together different sections of the novel. Still, I’m forgiving. Walter B. Gibson, the foremost writer of the series, was an amazing author capable of tremendous output. He was writing two novel-length Shadows a month and lots of other novels and short stories in his “spare” time over the course of ten years. I don’t think anyone has ever equaled that. 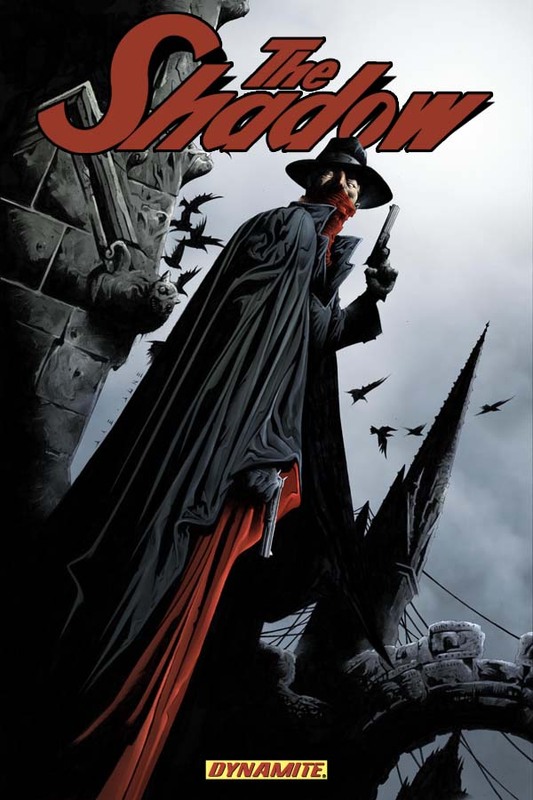 I got interested in the pulps again because Dynamite Comics has revamped the Shadow for a new comics series, which I’ve also got waiting in the wings to read. Know what you mean, Mel. I still have and love those Kaluta comics and the 80s film did a pretty good job with Lamont but I never could get into those early Walter Gibson novels and when I read one recommended by several Shadow fans as their favorite, Zemba, well, that one struck me as very low grade pulp writing which I really have trouble reading anymore. Lester Dent and Norvell Page were good writers, each with his own distinctive voice and approach, Mr. Gibson…not so much. You have really great writers who wrote for the pulpss–the usuals, Hammett, Chandler, MacDonald, etc–and the really eccentric guys who transcend quality control, guys like Daly and Bellem, and both ends of that spectrum offer their rewards. But to me Walter B. Gibson falls into that great gaping maw in between where toiled so many “journeymen” pulp writers whose work filled the market requirements of the day but isn’t really worth the time to the modern reader. This entry was posted on June 7, 2012 at 5:58 am and filed under Adventure,Comics Related,Crime,detective,Mystery,Pulps,series fiction,Young Adult. You can follow any responses to this entry through the RSS feed. You can leave a response, or trackback from your own site.